In what’s become somewhat of a habit on draft day, the Canucks dipped down the ladder with the 25th overall pick Friday in Columbus. 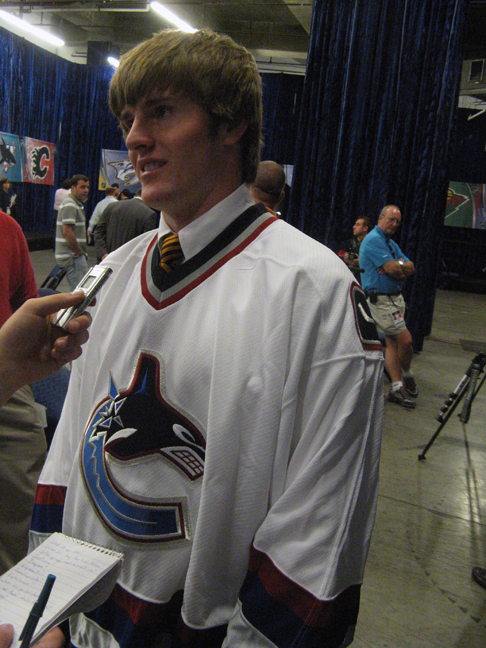 After selecting the unknown Daniel Rahimi with the 82nd pick last year, and nabbing over-ager Mason Raymond with the 51st pick in 2005, Canucks GM Dave Nonis took centre Patrick White with Vancouver’s first pick in 2007. White, a centre who tallied eight goals and nine points in 12 games with the Tri-City Storm of the USHL last year, was rated the 23rd overall skater in North America by Central Scouting. A Minnesota native, white played 17 high school games with Grand Rapids scoring 11 goals and 36 points before joining Tri-City late in 2007. He’s a player who thrives in the corner and in traffic. White will attend the University of Minnesota in the fall and has been selected to play in the 2007 Under-18 World Championships. 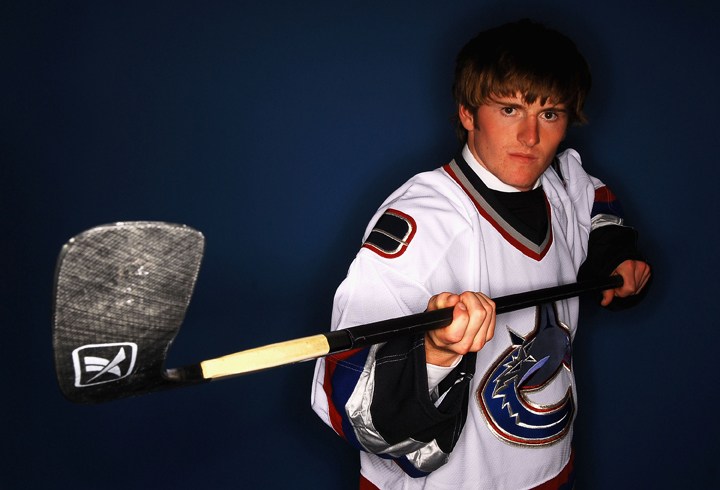 As much as any player in the draft, White has hockey in his blood. His dad Mark coached community college back in Grand Rapids and White spent his childhood on outdoor rinks. He made the leap from high school to the USHL after helping his team get to the State Championships in back-to-back years, and was named to the All-Tournament team. White was drafted by the Seattle Thunderbirds of the WHL, but opted to stay in high school in Minnesota. White names the legendary Herb Brooks as one of his biggest hockey heroes. The Canucks have three second-round picks, though Chicago has an option on the 56th overall pick, two fifth round picks, a sixth and a seventh. Hockey Profile: Named Associated Press Player of the Year for Minnesota boys hockey in 2007… named to the All-Tournament Team of the Class AA State Championships in 2007 after leading his team to the title game for the second consecutive year… played 12 games with the Tri-City Storm of the USHL totaling nine points (8-1-9) in 2007… will attend the University of Minnesota in the fall… selected to play in the 2007 Under-18 World Championships. Personal Profile: Has been called Whitey since the beginning of high school… wears jersey number six because his dad used to have the number… patterns his game after his dad “because he has coached and taught me everything”… most memorable hockey game ever played: the Minnesota State High School Championship game because “it was with my friends and in front of 18,000 fans”… if he could have dinner with any three people they would be: Herb Brooks – “I enjoy the 1980 Olympic story and hearing it from him would have been meaningful", Donald Trump – “he is a great businessman” and Lance Armstrong – “he has one of the most inspirational stories”… favorites include: “fake shot to backhand top shelf” (shootout move), Minnesota Wild (NHL team), Joe Sakic (NHL player), Deal or No Deal (TV show), Déjà vu (movie), Jack Nicholson (actor), Akon (group), Guitar Hero I and II (video games).